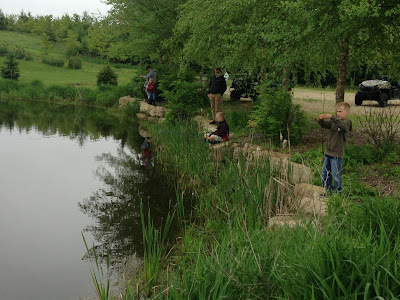 Under the Oak Tree: 1 fish, 2 fish, red fish, blue fish: what's in our ponds? 1 fish, 2 fish, red fish, blue fish: what's in our ponds? As shown on our Facebook page, Dave the Pond Expert was out recently doing some testing of 4 Winds Pond and Kitchi-Manitou. This testing included chemical analysis, depth measurements and fish sampling to give us an idea of how we can better manage these water resources. A beautiful day for pond surveying! 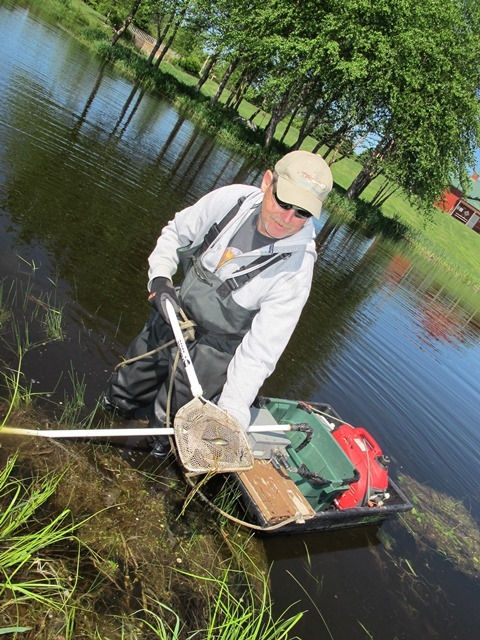 Dave sampled the fish by electroshocking: a pole sent an electric current through the water that temporarily stunned the fish, bringing them to the surface of the pond. Dave then used a net to catch the fish, identify them, and release them back into the water, where the fish went on their happy way. An efficient system: Dave carries a wand emitting an electric current and uses a net to catch the stunned fish. 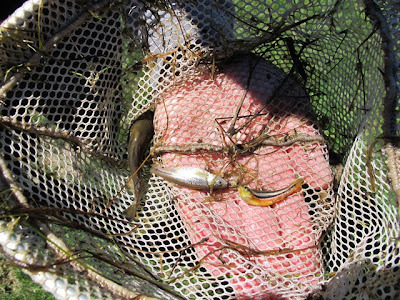 4 Winds Pond contains a surprising number of species including the Iowa darter and Northern redbelly dace, two environmentally sensitive species. Other fish included green sunfish, fathead minnows, golden shiners, black bullhead, yellow bullhead and mudminnows. Wildlife sightings included adult and tadpole bull frogs, green frogs, crayfish and painted turtles. Dave was encouraged by the water chemistry and the high levels of dissolved oxygen, indicating that winterkill conditions are rare. His recommendations for the pond included stocking it for recreational fishing purposes. A predator species like Northern pike would do well, as would largemouth bass. Dave also suggested establishing a no fertilizer or pesticide buffer around the pond, creating an island with a turtle nesting and basking site, placing a fallen tree in the water to improve fish and turtle habitat, and planting water lilies to improve pond aesthetics and fish habitat. Some of the species living in 4 Winds Pond, including a Northern redbelly dace. Kitchi-Manitou Pond is a spring-fed pond and thus, had significantly different chemical characteristics than 4 Winds. It’s colder, has a higher level of dissolved oxygen, and is more transparent (ie, clearer water). Kitchi-Manitou is home to some thriving native aquatic plants: common bladderwort, flatstem pondweed, Elodea, buttercup and small duckweed. Electroshocking here was more difficult, as the pond edge was trickier to navigate, yet it still yielded two species: brook stickleback and green sunfish. Wildlife spotted included wood ducks (I wonder if they’re tenants? ), turtles and frogs. 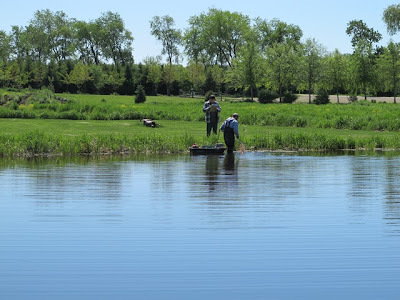 Dave had no immediate recommendations for the pond; we could consider improving access to it for better wildlife viewing or pursue a conservation aquaculture project if we’d like to rear rare fish species. Interested in seeing the full report from Dave? View it here. Working with Dave has been educational and interesting! 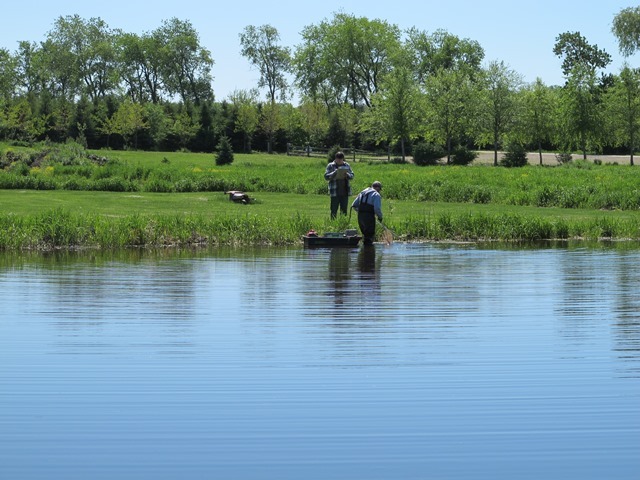 We’re grateful for his expertise as we consider how best to manage some of the Farm’s 17 ponds. For now, we’ll begin working on implementing his recommendations for 4 Winds Pond, as we already have a few eager fishermen ready to reel 'em in!